Many of my fondest memories of childhood include going to the old Baptist church in the small town where I was raised. Sundays were spent snuggled in a pew between my mom and grandmother who offered me Wintergreen mints and fashioned Kleenex carnations from the pocket of her purse to contain my wiggles. My dad, who was a deacon, brought us to Wednesday evening prayer meeting and my grandma taught the adult Sunday school class for over 3 decades. We packed out the building for week-long revival services every October and I experienced the truth of the Gospel, repenting of my sins and claiming the grace of Jesus alone for my salvation as a 10 year old. I was baptized and married in that same church, beneath its grand old stained glass windows and years later I grieved the passing of the ones I loved the most in that same spot. During my second year at one of our denomination’s colleges, I witnessed the face of Christianity change forever: Roe vs. Wade became the law of the land. Though I didn’t know this at the time, the anti-life agenda was ushered in, in part, by the very denomination I had called my own and I was soon to see those church members who had taught me Bible truths as a small child consider themselves “pro-choice,” embracing all sorts of aberrant teachings that would make past saints turn in their graves. Only a few years later, as a spiritually hungry young family with three preschoolers, we knew we could not raise our children in this church so we moved on. It was a bittersweet time but the Lord was preparing us for an even greater spiritual journey: homeschooling. What Schaeffer didn’t anticipate was one branch of the church that wanted no part of this disaster and would eventually become the bright spot for cultural revival: homeschooling families. While seminaries continued to send out graduates who were more interested in being relevant than faithful and denominations invested in high-tech buildings and elaborate strategies for growing the body of Christ, moms and dads opened their Bibles and school books, quietly teaching their own children and introducing them to a personal creator God who is intimately involved in all areas of life. Should we continue to support churches that have abandoned the Bible, including its teachings on the family? 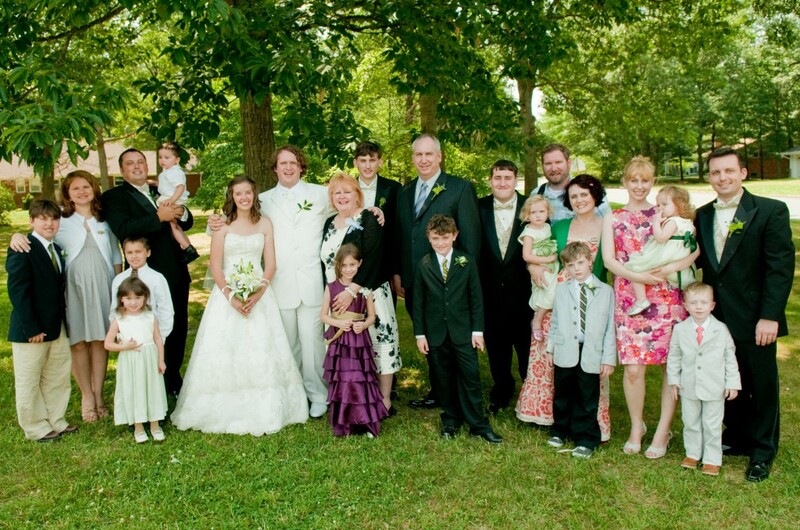 Should we join with other homeschooling families and plant a church? Does our own church situation help us as we raise our children or does it hinder our efforts? How do we avoid worldliness without being disobedient to the Great Commission? How can we have more meaningful spiritual lives? How do we prevent our children from becoming part of the current statistics that say only 10% of children raised in Christian homes maintain their faith when they grow up? As we began to teach our own children, we soon recognized that the homeschooling lifestyle brings with it new priorities. We saw the need to invest our time where it counted the most and that meant many of the traditional church “programs” had to be taken out of our schedule. Discipling young people and building solid, life-long mentoring relationships with them takes all your energy and your priorities become different than those of other families. We realized it might make more sense to spend five hours teaching Bible truths to our own children than it did using those same five hours to prepare a Sunday school lesson. We quickly learned that if we were going to have daily devotions as a family before Clay left for work in the mornings, we would have to forgo evening church activities. And as all four of our aging parents began to have significant health problems, we knew our children would learn more valuable lessons caring for them than participating in any organized youth group. It was at this juncture that we knew we had chosen a path that made other people uncomfortable and even irritated. We were seen as not really participating in the life of the church because too often that was defined as being part of church programs. We had come to the place where true Christian education was happening in our home but church life was frustrating and often painful. As Christians who are growing in our faith, we aren’t looking to be entertained or for a congregation that will babysit us or our children. What we want is the challenge to have a deeper relationship with Christ and encouragement as we apply Scripture to our lives. We want our church to equip us for the work of the ministry, first to our families and then to others. As we mature as believers in Jesus Christ, we realize the value of practicing spiritual disciplines like daily Bible reading, prayer, fellowship with other believers, sharing our faith with others, and using our spiritual gifts to build Christ’s kingdom. We also can look back over our spiritual journey and see how the Lord has worked in our lives by measuring our personal and family growth by the Bible’s standard found in Galatians 5:22-23: “But the fruit of the Spirit is love, joy, peace, patience, kindness, goodness, faithfulness, gentleness, self-control;against such things there is no law.” Through this process, frustrations with church life are inevitable and are even a good sign if we use them to honestly evaluate our own lives. Even though they may still attend a church, homeschooling families could fit into this category. They desire to hear solid Biblical preaching, participate in vibrant, God-honoring worship where the music, no matter what the style, reflects sound theology, and to be involved in the lives of others who share these convictions. They also believe it is important to serve others within the body of Christ alongside their own children. In looking for a church home, it is tempting to find refuge in congregations that affirm our choice to homeschool. But, as appealing as the family integrated church movement might be, it is wrought with as many if not more dangers than being in a traditional church. In frustration with program-driven churches, the past ten years have seen a rise in the family integrated church movement. Wanting to avoid the age-segregation and often downright waste of time of many youth ministries, homeschooling families began trickling out of their traditional churches and joining with others to form small congregations with like-minded believers. Currently there are several thousand churches that consciously identify themselves as family integrated and those numbers are growing. The attraction to family-centered churches is understandable, especially for those who feel beaten down by their past religious experiences. Those who gravitate toward them are typically very serious about discipling their own children and family worship lead by fathers is the expected norm for every household. Most members have already wrestled with the concept of having a Biblical worldview and have come to have the proper understanding of issues like abortion and homosexuality; there is rarely a threat that theological liberalism will take over or that the excesses of the emergent church will influence the congregation. Fellowship between families is encouraged and hospitality is regularly practiced. Children are welcomed in all aspects of church life, including worship, where their participation isn’t considered to be unusual or a distraction to adults. However, there are some very real dangers about this movement that should be considered. Isolation becomes the standard as very few of these churches have any families who are not homeschoolers and public school or Christian school families are not welcomed unless they are willing to be “brought along” in their thinking about education, meaning they should be working toward the goal of homeschooling. Though age-integration is promoted in these churches, rarely are there retirement age, elderly, or single adults unless they are part of a particular family. If the church sponsors evangelism or missions efforts, families are rarely involved other than by their financial support. Too often, the Gospel within the FIC church is family reformation through homeschooling and lifestyle changes for the father’s glory rather than the work of the Holy Spirit to transform individual lives for the glory of our Heavenly Father. The Biblical doctrine of the priesthood of the believer is ignored and replaced with a heavy-handed authority structure both within the home and the church that resembles little of what the New Testament church is to be. Often the established paradigm leaves no room for personal convictions of individual families in the areas of courtship, dating, college, etc. and many young adults are forced to conform to ideals they don’t believe for fear of being labeled “rebellious.” Rather than teaching the absolutes of the Word of God, trusting that the Holy Spirit will lead each one into righteousness, the church ends up nurturing a generation of young Pharisees who haven’t been given the opportunity to embrace their own convictions regarding nonessentials of the faith. Frequently those leading the church have little to no theological training resulting, in eisegesis(3) rather than exegesis, which leaves the doors open for all sorts of strange and new interpretations and applications of Scripture. The result is a long list of requirements for “biblical family life” that often results in an “us against them” mentality and the temptation for families to compare themselves among themselves, which Scripture warns is not wise. (2 Corinthians 10:12) This also leads to ignoring the amazing gifts and talents among individual members of the family…sons and daughters, mothers and fathers… that God has so uniquely designed to function together for His glory! The whole body of Christ needs homeschooling families and we need the whole body of Christ! Author and apologist, Phillip E. Johnson, once remarked “When pressed in interviews to name my heroes, I have spontaneously responded that they are homeschooling mothers! To me, the heroic mothers who nurture the next generation of faithful Christians are among the leaders of the church.” I heartily agree! Homeschooling moms are typically tremendous examples of godly womanhood and a picture of devotion to building Christian homes. Homeschooling dads, through their commitment to wives and children, are some of the best examples of genuine Christian manhood in the church today. I recently asked several pastors what their experiences with homeschooling families were like in their congregations and they confirmed what I had suspected: homeschoolers are among the most dedicated of their members. They out distance other families in their willingness to serve others, and their children are more apt to weather any rough spots in their faith because their parents have been so greatly involved in their spiritual training. As we diligently apply the Word of God to all areas of life, we become an example that the whole body of Christ needs to see. There are so many families who are really struggling with even basic issues of faith and many desperately need help in building relationships within their marriages or with their children. Though we are certainly not perfect, as we depend completely on God’s grace for raising our children, we can have a tremendous opportunity to encourage and serve others as they witness our own trials and triumphs. We also need to be involved with aspects of the body of Christ that are not focused on homeschooling. There are many godly older couples who have much to teach us about stages of life we have not yet experienced and their mentoring of us through empty nests, deaths of spouses, and other significant life changes is so valuable. We need to hear the testimonies of those who are involved in vocations where secular humanism runs rampant, gleaning perspectives we will not experience in our homes. We need exposure to all ages and all backgrounds and cultures, whether from across town or across the world. We need wisdom and edification from Scripture taught by doctrinally sound pastors and teachers. We need opportunities to participate in evangelism and to experience the joy of seeing new people come to Christ! We need the whole church! Jesus gives us these two great commandments: “You shall love the Lord your God with all your heart and with all your soul and with all your strength and with all your mind, and your neighbor as yourself.” (Mark 30:31) When we focus on obedience to these, I believe the Lord will lead each homeschooling family into His service within the body of Christ as we prepare the next generation to truly be His church! (1.) The Great Evangelical Disaster, page 37. This article originally appeared in the Home Educating Family Magazine, 2011, Issue Two. I completely believe this and think it is already starting to pick up. I know quite a few people who love Christ, practice their faith, and take their spiritual growth seriously who have stopped attending church for various reasons. None of them want to be apart from the church, but church had become so problematic that they simply walked away. That is a very good article. As a homeschooling mom myself, I have to admit that I have seen the atmosphere of homeschoolers really just wanting to shelter their children.I’m sure that some have thought that of us..lol..As I look at the church we have been in for the last five years–we are a mix of every type of education. I would also have to say that as a mom to four adult(former homeschooled)children, they will be out in this world someday and we really do need to prepare them to be ready.The last article says it well and like it should be.Praise God!! I meant the last “paragraph” sums it all up beautifully! Thank you for your efforts at helping homeschooling families see the loving face of our Savior instead of the scowl of self-righteousness. The more level-headed homeschooling that this article represents is a breath of fresh air compared to the holier-than-thou attitude found in too many so-called homeschooling leaders and conferences. As one who does *not* have your experience with homeschoolers, your transition through this approach is something I have watched with keen interest. What is most fascinating is the legalism you experienced and rejected. Even though I went through the public school system while a general Evangelical of the 80s (even attending Gothard seminars), I find my experience similar to some of yours and Reb Bradley and other I know locally. Legalism is not unique to homeschooling. The struggles that many homeschooling families struggle with are *not* unique, it seems to me, but rampant in the church as a whole. By the same token, the fact I am only starting to homeschooling (my child is two) means I do not fully understand why people call themselves ‘homeschoolers’ so readily. That is, it seems, and maybe this is not your intent, that being a homeschooler is somehow a class unique among Christians. Maybe a little better? This observation comes from your article actually: “I recently asked several pastors what their experiences with homeschooling families were like in their congregations and they confirmed what I had suspected: homeschoolers are among the most dedicated of their members.” You then point out how such families can be an example and help to others given this (unintentionally) implied maturity that (most?) other non-homeschooling families do not have. If I am mistaken, please correct me. Perhaps it pivots on your definition of ‘homeschooling’? Another way of asking this is: should we label ourselves Christian homeschoolers or homeschooling Christians? The former puts Christian as an appendix. The latter puts homeschooling as an appendix. Yes, I have read those amazing stories about narrow-minded Christians. By God’s grace the church I’ve attended the last 18 years never had such attitudes (we had other sins we struggled with!). Most of our nearby sister churches have has similar experiences. Our church has a mixture of formal educational approaches but all committed to Christian nurture. You know, I struggled myself with how to word the thoughts you quoted! Susan is correct in that my target audience for the article was Christian parents who homeschool their children. The reason for the phrase “Christian homeschoolers” is to differentiate between those of us who are Christians who homeschool and those who are not believers who homeschool. It is important to make that distinction because the majority of homeschoolers today are not Christians and I want to be careful to not assign expectations we rightly assume of true Christians on to those who are not in the faith. For example, I think we should assume that genuine Christians will want to impart their faith to their children and that discipling them is the most important aspect of their parenting/homeschooling journey. (It is not legalism to assign that to them, though some will argue such.) Homeschoolers who are not Christians are often (rightly) touchy about being lumped in with those of us who are because HSLDA has taken it upon themselves to frequently speak for all of us with legislators etc. It has caused problems in the past and I am sure will in the future. This is a huge issue that is now influencing many state conventions and support groups, in part because even true Christians are often being left out of these groups because of their views on courtship etc. Keeping this in mind, my experience is that homeschooled young people typically demonstrate a general maturity it is rare to find in those who are surrounded by their peers for many hours in a day. I have done a lot of substitute teaching and have observed that even many kids who are regularly active in their youth ministries and churches blend in with their peers. Christian schools often foster the same environment; the key is the peer situation. I wish everyone could experience what I did with teaching a group of homeschoolers for a public speaking enrichment class. There is just no comparison and I have had this experience in several different locations with homeschooled children from dozens of families. There were several clear differences I noted: The subjects they chose to speak about were unique and of importance to our society. They came well prepared and pursued their topics with passion because they were allowed the freedom to study so many valuable and not politically correct topics at home. Each of them reflected having thought through difficult things with a Biblical worldview in mind. They were kind and encouraging to one another and I really loved seeing 18 year olds treating the 12 year olds as peers. In one class I had 3 sisters who were each other’s best supporters! In one of my classes, I had a young man with Down’s syndrome. I was amazed at how these kids bent over backwards to accommodate his needs and to befriend him. There was not one time in teaching any of these kids where I had to correct behavior or felt that any of them were being sneaky or disrespectful. I share this because I know unless you have experienced grown homeschooled kids outside of church, it is hard to know the difference. I think this is one of the problems for homeschoolers with youth ministry….usually things are geared for more immature kids. And I am not necessarily talking about spiritual maturity, just the difference that peer saturation makes. 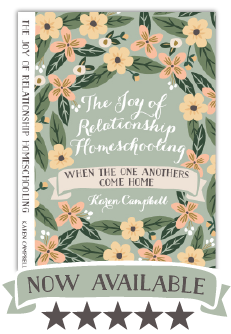 When I talked about the things we as homeschooling families have to offer others, it is those things that we have learned having worked through many issues in our homes others might not have dealt with. Some people think that if they homeschool, it will solve problems they have. The truth is that homeschooling shines the light on problems and difficulties, whether it be individual issues of family members or in relationships. If family members are apart from each other for most of the day, are running here and there for activities apart from each other and even all your church activities are done separately, it is easy to ignore problems, to stuff them under the rug. When you are together all day, you are forced to address issues. This is why I think most homeschooled siblings continue to be friends when they leave home. They have become each others’ peers and have learned to solve problems which translate to problem solving skills in other relationships. I also agree with Susan that homeschoolers often participate in ministry together, allowing kids to grown up learning to serve others. One of the pastors I spoke with mentioned this to me, that homeschooled kids in his church often volunteered to do things to help. Finally, Susan brought up the truth that homeschoolers often do not feel welcomed into churches. Sadly, we have brought some of this on ourselves. I look back at some of our own interactions and wish I could go back and do them over. But often, as I mentioned in the article, one of greatest problems we have fitting in is that we are so fiercely independent and are do-it-myself sort of people. Our commitment to teaching our own kids make us appear to not be team players. The church needs to get over the need for everyone to participate in programs and to realize that being at the church every time the door is opened does not equal spiritual maturity. There is a need for understanding, humility, and honest evaluation as we look at this issue. We must recognize that not all choices people make for the education of their children are equal. Too often, I have seen homeschoolers feel pressured into affirming bad education choices or child raising choices to keep the peace. While I am not willing to go where Voddie Baucham or Doug Phillips go on this issue, I am also not going to close my eyes (or mouth) when it comes to the dangers of putting kids into a secular education system that has as its agenda to destroy the very faith of my kids. The whole church needs to own up to this truth. It’s funny to think about it (well not really), but when home schooling began mid/late 80’s, the church was already on a steady decline. It’s a critical & relevant thought to think that home schooling was a response to a dying church. Then in retrospect, we have a movement, home schooling, that has become it’s own church, via Family Integrated Churches, etc. I agree that church activities pulls families apart & undermine a parents responsibility. It pulls away the relationship building process that a mother/son, father/daughter, brother/sister, etc. should be cultivating. In church we are encouraged to take care of every ones else’s needs, so we actually neglect our first responsibilities, our own generational lines. B.U.S.Y. = Being Under Satan’s Yoke.. Churches should be supporting families to do the work of Christ in our homes, not families supporting churches. Yet Church Institutions have reversed the model. Home schooling tried to switch it back. But where is the balance????? Thank you for explaining your thoughts Karen. It is obvious from you and the comments of others that my experience with homeschoolers in my church and other Reformed churches locally does not match the wider community. Of course, I do acknowledge with you (against the implied assumption of other homeschool leaders) that many homeschoolers are not Christians. Also, (at least) my church has never pushed being busy (like my old charismatic church of 2000 members!). That excessive business is a problem that cuts into family time, unduly pressuring parents to feel more “godly” by doing “more”. Hey Karen! Been awhile since I commented…used to read all of your stuff regularly through all of our Vision Forum and Femininity stuff a few years ago but kinda fell away from blogs for awhile. Sallie linked to this and I just read it. Awesome…and I ask the same questions you ask as a homeschooler who has no idea what “real” church looks like anymore. Thanks for your always-thoughtful words ! Lindsey, so so happy to hear from you! You have been missed, girl!!!!! I have been doing a lot of reading and researching about the state of the church today and plan to write a lot more about it…..the Barna research is staggering! I went through this – and we found “family integrated church” in the confessional Lutheran church. . .it isn’t FIC, as we think about it in the context of this blog though, I think that if one is looking for a church that values tradition and children (and not legalism) a look at more liturgical churches *might* be the answer, it was for our family. We have been extremely blessed. Heading there to check this out Shawn. I am starting to hear some feedback from people who attended the recent NCFIC conference and plan to post so of it in a few days. I don’t think most people realize how the movers and shakers within this movement are not interested in true dialogue but rather intend to take dominion over one family, one church at a time. I eagerly await your post. Could we revisit this topic? The small church I attended (a Calvinistic Baptist congregation) has several families who home school, including the pastor and assistant pastor. We have at least one family that wishes we were FIC (that will never happen as long as either of our pastors are still there), but because of our expository preaching and firm commitment to the authority, inerrancy, etc. of scripture they are active members. As far as I am aware, no one seems to care who home schools and who doesn’t…it is a matter of Christian liberty. I have a friend who is the pastor of a PCA church and their congregation is pretty much like the church I attend. Is the primary problem experienced related mostly to FIC-related issues? Granddad, I really want to revisit this topic in a new post and will get it up today, Lord-willing. I have heard from some people since this series ran and their stories are significant to the discussion.